I was in the LA area two weeks ago visiting several distributers. I met with our West Coast Sales Rep’s David Romar and Ron Miller, based in Lancaster, about 2 hours north of LA, close to the Mojave area, a fascinating part of our country. For flying enthusiasts, it’s exactly between Edwards Air Force Base and Lockheed’s Skunk works. Dave & Ron’s business covers all the Western states, including the Rockies and further south, along with Hawaii. Among the many things we discussed, we reviewed the 6 new collections Avenue Mosaic introduced at Coverings. It’s fair to say all designs were well received. Inspirations: I am often asked about what inspirers me. To start, I look at the current tile trends, as the saying goes, you cannot drive forward looking in reverse. I draw from many sources including books, magazines, nature, and places I visit. In coming post’s, I will be sharing some favorite inspirations. 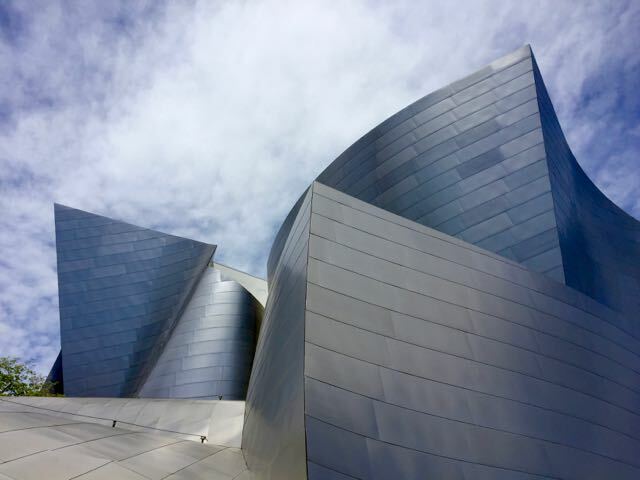 While in LA, I visited Frank Gehry’s Disney Philharmonic concert hall. I highly recommend giving yourself an hour or two to explore this wonderful building. As you likely know, it’s a swirly whipped cream titanium structure. With the exception of the floors, there are almost no straight lines inside or out. While strolling each floor up to the roof terraces, and ending with the back garden, I could not stop smiling. Every turn I took featured a new bold discovery of this sculptural dream. See below some of the many images I snapped. With in the next several months, AveMos is staged to grow our supplier list from 9 sources to 15. We are rapidly developing designs for our own distribution and our distributor partners. I like to track my yearly progress with putting ideas “on paper”, (it’s geeky I know), but for week #17, I’m at 38. Goal is always above 100 per year. BTW, Marmocer USA is now showing / selling 2 tile designs I created, stay tuned for more details next post.